Top, Bag, Skirt & Shoes : Topshop. Necklace : H&M. Sunglasses : Camden Market. Myself in London on the way to Bloggers Boutique! I had written a post covering the Bloggers Boutique event, but it just didn't look terribly good once I'd finished it and other girls (like the lovely Sammi) had captured much better images than I had! You looks so pretty love the skirt! I love that skirt, gorgeous colours! I love the cream bag, the shape of it is so cute! ive literally been HUNTING for that necklace, it's sold out everywhere! sigh, look how perfect it looks with your outfit. I completely emphasise about summer dressing; I've been dreading it the past few weeks and hiding with jeans and sheer shirts, but just as I felt about ready to embrace the heat, the rain has started pouring again and I'm back in my woolly jumpers! beautiful outfit! so cute, and great color combination! The skirt is amazing! You look so beautiful. and the bag does look like pope's hat! It's friggin amazing!!! I love this outfit! The colors are so pretty!!! That's what I call fashion AND style. Amazing outfit! I love how you have accessorised it, the bag is gorgeous! Beaut outfit, such a perfect way to dress in the heat! 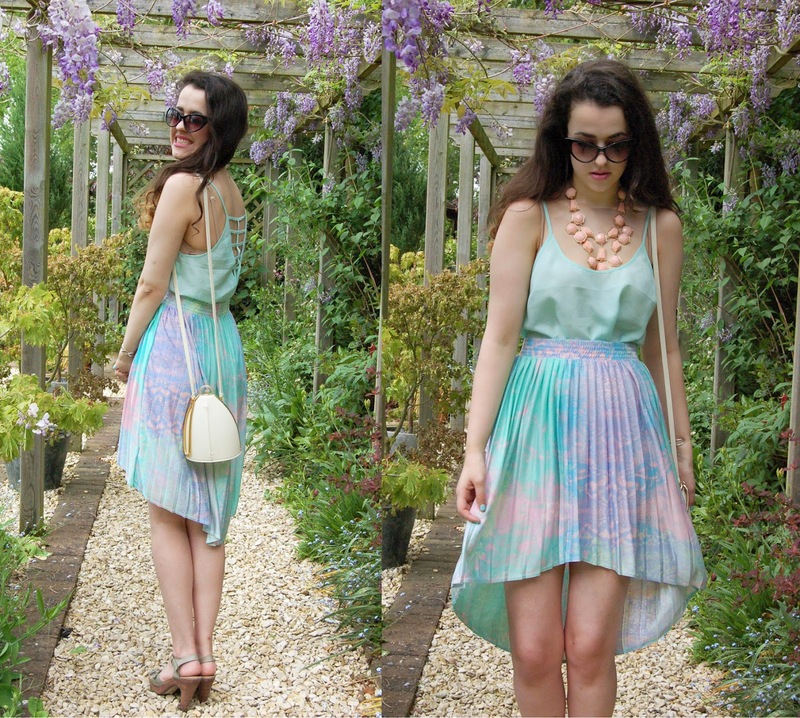 The colours are all gorgeous on you, particularly love that skirt its so pretty! I'm loving all the pastels at the moment :) that skirt is gorgeous! And I'm really loving your lipstick too! Absolutely love your necklace and your bag!! Love your dress, it's so pretty. all of these pastels are making me happy! so beautiful! I love this outfit, the skirt is so cute! Oh I love the outfit! I'm in love with your white purse!